I am now, I fear, going to utter a politico-economical heresy. I have great respect for political economy. I entirely believe as you may have seen in the law of supply and demand and free exchange and safety of capital, which are the first conditions of industry; but there is one point on which I am sorry to say I am a very lame political economist, and I cannot keep pace with others. I find political economists denouncing all interference, as they call it, of Parliament with the supply and demand in any form of any article whatsoever. They argue that as a reduction of the price of bread gives the poor more food, and as the reduction of the price of cloth gives the poor more clothing, so the reduction of the price of intoxicating drink gives the poor a greater abundance of comfort Now, gentlemen, I do not introduce this for the purpose of giving any expression on the Permissive Bill. I have done that at other times and elsewhere; this is not the place for it, neither was I invited for that purpose. But I give that instance to show that the principle of Free Trade is not applicable to everything. Why is it not applicable? Because it is met and checked by a moral condition. There is no moral condition checking the multiplication of food and the multiplication of clothing the multiplication of almost every article of life which is not easily susceptible of an abuse fatal to men and to society. Well, now, I am afraid I am going to tread upon difficult ground, but I must do so. I am one of those, which is of no importance, but Mr. Brassey is also one of those, and that is of a great deal more who are of opinion that the hours of labour must be further regulated by law. I know the difficulty of the subject, but I say the application of unchecked political economy to the hours of labour must be met and checked by a moral condition. If the great end of life were to multiply yards of cloth and cot'ton twist, and if the glory of England consists or consisted in multiplying without stint or limit these articles and the like at the lowest possible price so as to undersell all the nations of the world, well, then, let us go on. But if the domestic life of the people be vital above all; if the peace, the purity of homes, the education of children, the duties of wives and mothers, the duties of husbands and of fathers, be written in the natural law of mankind, and if these things are sacred, far beyond anything that can be sold in the market, then I say, if the hours of labour resulting from the unregulated sale of a man's strength and skill shall lead to the destruction of domestic life, to the neglect of children, to turning wives and mothers into living machines, and of fathers and husbands into what shall I say, creatures of burden? I will not use any other word who rise up before the sun, and come back when it is set, wearied and able only to take food and to lie down to rest; the domestic life of men exists no longer, and we dare not go on in this path. I am not going to attempt a prescription: I should fail if I were to attempt to practise in an art which is not my own, but this I will say Parliament has done it already. Parliament, at the instance of Lord Ashley, now Lord Shaftesbury, whom all men honour for his life of charity, has set the precedent. . . . Parliament has again and again interposed to forbid the employment of children in factories before a certain age. Parliament has interposed over and over again with the freedom of labour. More than this, Parliament has interposed to prevent fathers and mothers from selling the labour of their children. . . . They may not use the labour of their own children to enrich themselves if the employment of that labour be injurious to the child. Do not let it be said, therefore, that Parliament has not interposed in the question of labour and in the question of the hours of labour. I will ask, is it possible for a child to be educated who becomes a full-timer at ten or even twelve years of age? Is it possible for a child in the agricultural districts to be educated who may be sent out into the fields at nine? I will ask, can a woman be the mother and head of a family who works sixty hours a week? 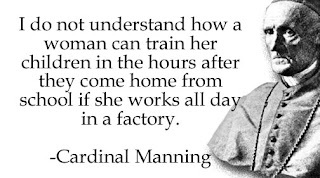 You may know better than I, but bear with me if I say I do not understand how a woman can train her children in the hours after they come home from school if she works all day in a factory. The children come home at four and five in the afternoon; there is no mother in the house. I do not know how she can either clothe them, or train them, or watch over them, when her time is given to labour for sixty hours a week. I know I am treading upon a very difficult subject, but I feel confident of this, that we must face it, and that we must face it calmly, justly, and with a willingness to put labour and the profits of labour second the moral state and the domestic life of the whole working population first. I will not venture to draw up such an Act of Parliament further than to lay down this principle. I saw in my early days a good deal of what the homes of agricultural labourers were. With all their poverty they were often very beautiful. I have seen cottages with cottage gardens, and with scanty but bright furniture, a hearth glowing with peat, and children playing at the door; poverty was indeed everywhere, but happiness everywhere too. Well, I hope this may still be found in the agricultural districts. What may be the homes in our great manufacturing towns I do not know, but the homes of the poor in London are often very miserable. The state of the houses families living in single rooms, sometimes many families in one room, a corner apiece. These things cannot go on; these things ought not to go on. The accumulation of wealth in the land, the piling-up of wealth like mountains in the possession of classes or of individuals, cannot go on if these moral conditions of our people are not healed. No commonwealth can rest on such foundations. I have endeavoured to draw out before you what is the dignity of labour. It is the law of our state, the law of our development and perfection, the source of invention, the power of creation, and the cause of manifold capital in money and in skill. And as to its rights, I have shown that it is true property, true capital; that it has a primary right of freedom, a right to protect itself, and a claim upon the law of the land to protect it. I will only add that there can be nothing in a working man undignified unless he be himself the cause of it. Forgive me if I use a very common proverb, and if I make another like it: "An idle man is the devil's playfellow; and an intemperate man is the devil's slave." As to the rights, I know nothing that can ever limit the rights of a working man excepting his committing wrong. If he commits wrong, the strong may retaliate; if he does no wrong, the supreme power of law will protect him. Now, gentlemen, I have detained you a great deal longer than I ought a great deal longer than I intended. I will therefore bring what I have said to an end. . . . I ought to have my say, but at the beginning, not at the end, of an evening ; and therefore with ethics I will conclude. The science of morals rests on four foundations on prudence, which guides the intellect; on justice, which guides the will; on temperance, which governs the passions; and on fortitude, which sustains the whole man in the guidance and government of himself. These four cardinal virtues of the natural order perfect the character of man; and to-night I am not speaking in any other sense. They underlie all the dignity of man, and they justify all his rights. The labourer in our common field of toil who is prudent, just, temperate, and brave, is indeed "A workman that needeth not to be ashamed " (2 Tim. ii. 15).